At book fairs and other book marketing venues, people stream by trying to avoid you and your sales pitch. You must catch their eye. Make your book display table bright and appealing, pique their interest. Display your book prominently and try a prop that represents the subject or theme of your story. For my novel, RIM TO RIM – Death in the Grand Canyon , I use a backpacking stove and colorful mug. Give them things to look at . . . a word cloud poster, for example. 1) Type up a list of words found in your manuscript. Choose strong verbs and nouns, locations, main character names, theme descriptors, and whatever other words that give meanings you want to convey. Keep in mind that phrases will not stick together, so exclude “the”, “to”, “and,” because they will be displayed separately. 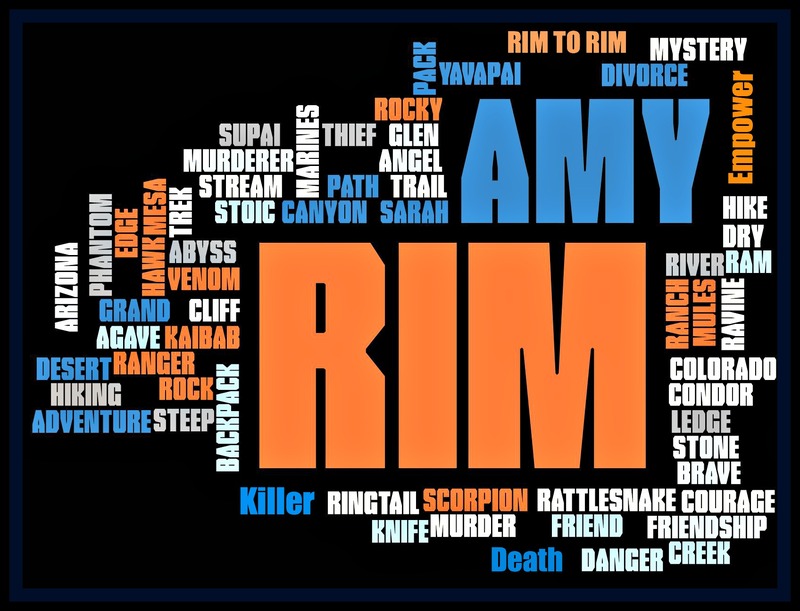 I wanted “RIM” to be prominent, so I typed it three times into my list. Type your main characters in twice to accentuate them on the poster. Friends suggested http://www.wordle.net and http://www.tagxedo.com, but I used www.prowritingaid.com which is a cool manuscript editing website. The free demo is a great tool to see how well you’ll like their software. It also allows you to create a word cloud either from the sample document you could download into the software or by cutting and pasting the list you created in Step 1. Double click on “Re-create Cloud” to view another and another version until the color and arrangement is to your liking. File them all in your computer’s photo storing software or in a general image file. Visit www.picmonkey.com and upload your favorite cloud by clicking “edit a photo.” If you have no edits to make to your saved cloud image, you might be able to skip Step 3 and up-load your image file directly to Vista Print in Step 4. From the frame icon on the left side, choose a simple frame to put around your cloud photo to give more space around the cloud so words are not cut off when it is printed. Choose a frame color, inside and outside, that will blend with the cloud’s background. Widen it a bit. If your cloud left a few blank spaces, use “Text” to put new words in, matching colors and font. Print 8 x 11 versions of the word cloud on heavy paper on your printer. It uses a lot of ink and may curl thinner paper, but it’s a good sample. Larger posters can be printed by www.vistaprint.com. On the Vista Print website open the marketing/signs/poster menu for sizes. You may get a low-resolution warning, If you changed the size to 1600 x 1200 or more in Step 2, you can ignore the warning. The next screen allows you to resize the image so it fits within the printing area (not needed if you edited in PicMonkey.) You may also add text here, but color options are limited. When you’re happy with your poster image, click “Approve”. I chose the glossy finish, because I think it looks more finished. With your jazzy new poster, you’ll stop potential readers just long enough to give you an opening. You must then draw them in with your winning smile, conversation, and perhaps a small give-away. Enjoy your next book fair. Oh wow! Thank you so much for sharing this useful information.